Roof Mount - conforms to roof pitch. Post Mount - attaches to any vertical surface. Deck Mount - attaches to horizontal surface. The Boxer Garden Weathervane is a perfect addition to the garden decor of the Boxer Dog Lover Home! 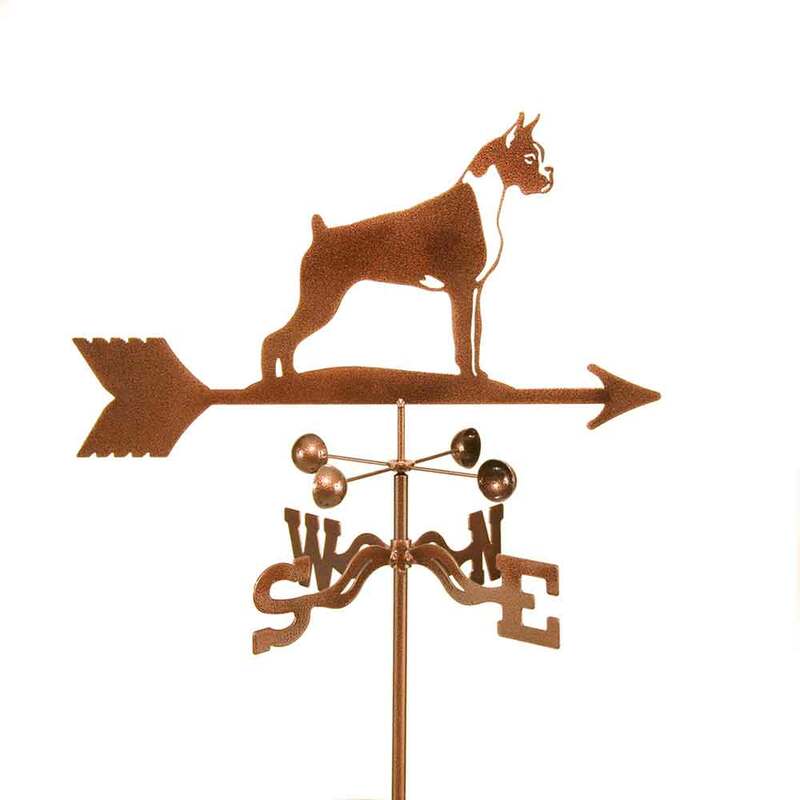 The weathervane includes the Boxer topper, a sealed ball bearing wind cup, the directional, and your choice of mount. Our Boxer Weathervane has a 3 step coating process that is specifically designed for a beautiful and durable finish that will provide years of enjoyment. A zinc chromate plating is applied on the base metal for better adhesion and durability - and most importantly - to prevent rust. Then a beautiful antique copper vein powder coat is baked on. And last, a clear powder coat is baked on to protect it against the UV rays and provides a durable, scratch resistant finish and will help with fading. A must for the Boxer dog lover! Made in the USA. Roof Mount is 15in long and conforms to roof pitch. Post Mount is 15in long and attaches to any vertical surface with 3in x 3in mounting plate. Deck Mount is 15in long and attaches to horizontal surface with 3in x 3in mounting plate.